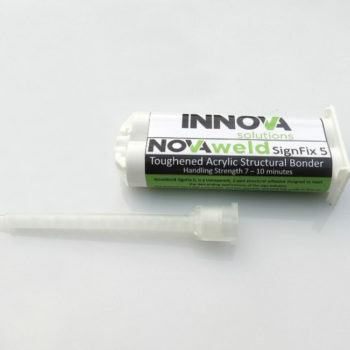 NovaWeld SignFix 5 is a 2-part structural bonding adhesive based on a blend of methacrylates. 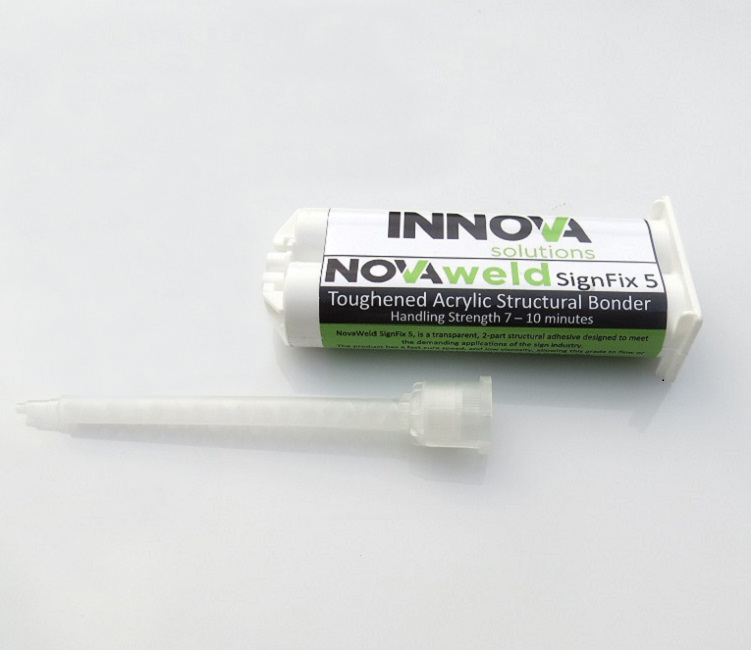 SignFix 5 is designed for high strength structural bonding of composites, metals and thermoplastics while remaining crystal clear. SignFix 5 is ideally suited to bonding transparent substrates. It offers excellent chemical resistance including hydrocarbon solvents and acids and bases from 3-10 pH. Tested on Brookfield RV at 25°C, Spindle TC93 at 2.5RPM. Working time is defined as the time between the correct and thorough combination of both adhesive parts and the point at which the adhesives are no longer useable i.e. it has started to gel. The times presented were tested at 24°C. Fixture time is defined as the time in which the bonded static joint will support a 1kg dead weight on a 12.7mm x 25.4mm lap joint at 23°C. Figures quoted are for gap-filling capability. It should be noted that optimum bond thickness is 0.6 to 0.80mm in order to achieve maximum strength development. SignFix 5 is flammable. Keep containers closed after use. Gloves and safety glasses should be in use when applying the products in order to avoid skin and eye contact. In the case of skin contact, wash with soap and water. In the case of eye contact, flush with water for 15 minutes and seek medical attention. Harmful if swallowed. Keep out of reach of children. Avoid heat, sparks and open flames. See MSDS for detailed safety information. N.B. Large amounts of heat can be generated when large masses of this product are combined at one time; the resultant heat generation can result in the release of trapped air, steam and volatile gasses. To avoid this, use only enough material as is required for the application and confirm gap thickness to no more than 4mm. Further application advice is available upon request. SignFix 5 may be applied manually or with automated equipment. Static mixer selection is critical to the correct functioning of this adhesive. To assure maximum bond strength, surfaces must be mated within the specified working time. Use sufficient adhesive to ensure that the jointed area is filled when the parts are pressed together. All adhesive application, part positioning and fixturing should be completed within the working time of the adhesive. All automated equipment should be constructed of stainless steel or aluminium. Avoid contact with copper in all fittings and pumps etc. Seals and gaskets should be PTFE, ethylene/propylene or polyethylene. Avoid Viton, neoprene or nitrile/BUNA-N elastomers for gaskets and seals. To clean up solidified adhesive, carefully scrape away excess and clean with solvent. Ideal conditions for adhesive use are between 23°C and 25°C. Temperatures below 23°C will slow cure speed; above 25°C will increase cure speed. The viscosities of the adhesive are also affected by temperature therefore any automated filling or dispensing systems should maintain constant temperatures throughout the year. The shelf life of the adhesive (part A) is 6 months and the shelf life of the activator (part B) is 6 months. These storage times are based on continuous storage between 8°C and 10°C. These products should never be frozen. When repackaging from bulk containers to cartridges we recommend that the material is filled in to packaging constructed of Polybutylene terephthalate (PBTP) please contact us for further information and advice. 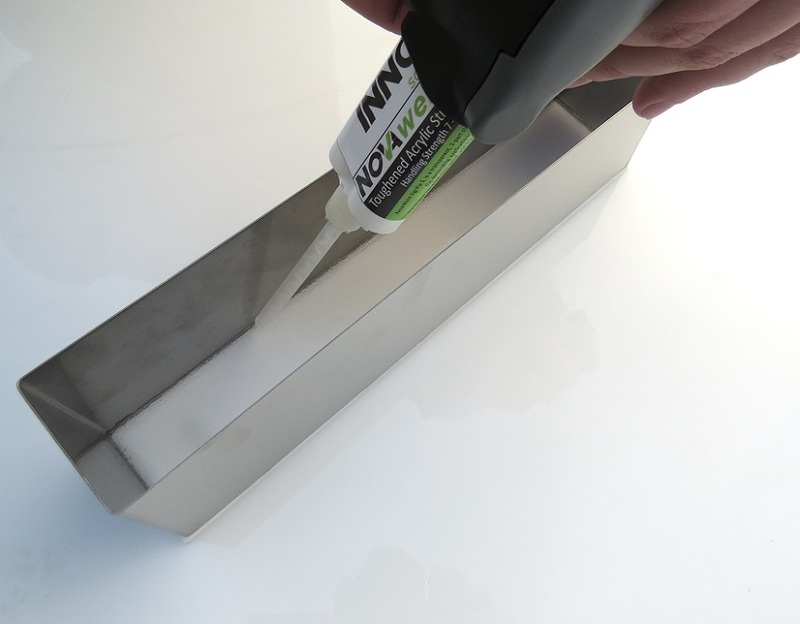 Innova Solutions Ltd. recommend that all substrates be tested with the selected adhesive in the anticipated service conditions in order to determine the adhesives suitability for use.